Note: If Eastern Z-Bar is ordered, then a 1/4" spacer has been attached to the rear side of the z-bar. At installation, drill 1/8" holes through the spacer using the installation holes in the z-bar as a guide. If you purchased a door with handleset prep, double check the location of the handleset prep and make sure it does not interfere with the prime entry door handleset. Wipe the door slab down with a soft cloth to remove any metal burrs. Position z-bar 1/8" above the door and attache using #8x 1/2" Phillips washer head screws through the countersunk holes located on the piano hinge. If more support is needed, additional screws can be added at this time. Position z-bar 1/8" above the door and attach using #8 x 1/2" Phillips washer head screws. Insert the vinyl sweeps into the grooves at the bottom of the expander and pull it to the other end. Note: The vinyl sweep is packaged in the hardware kit. If the vinyl sweep has become kinked during shipment, place it in boiling water for 3 minutes and the sweep will return to its original shape. Pinch the ends of the sweep grooves with pliers so the sweep will not pull out. Cut off the excess vinyl with scissors or a knife. Slide the bottom expander over the bottom of the door, pushing it onto the door as far as it will go. Do not install the screws.Screws will be installed during the final adjustments. Note:It is very important to make sure the door is centered in the opening. It may be necessary to shim behind the z-bars in order to properly center the door. Tilt the door into the opening making certain to center the door. Hold the door firmly in position and drill a 3/32" pilot hole through the very top of the hinge side z-bar mounting hole and install (1)#6 x 1" screw. Using a level, make sure the z0bar runs straight up and down, then drill and install the remaining screws. Note:If Z-Bar build out (formerly called Eastern Z-Bar Adapter) is ordered, a 1/4" spacer has been attached to the rear side of the z-bar. At installation, drill 1/8" holes through spacer using the installation holes in the z-bar as a guide. 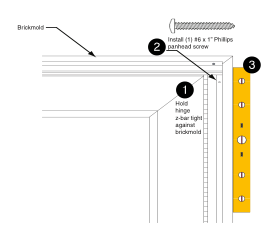 Holding the z-bar header in place, drill a 3/32" pilot hole into the top trim board or brickmould through the header mounting hole, maintaining approximately 1/8" clearance between z-bar header and door. Fasten the header firmly in place using #6 x 1" screws. Check and make sure the door operates properly. With the door open, locate the pre-drilled mounting holes in the z-bar and drill 3/32" pilot holes through the mounting holes and install. 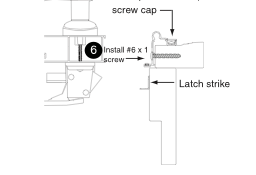 Cut and install latch side z-bar maintaining approximately 1/16" clearance between the door and z-bar. Center pilot hole in slot of expander. 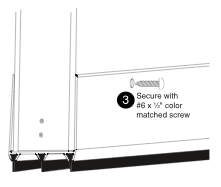 Secure with (2) #6 x 1/2" color matched screws. Remove the Template from the handleset box and read the manufacturer's instructions carefully. Note: If you ordered a door already handleset prepped, you will not need to drill for the template holes. 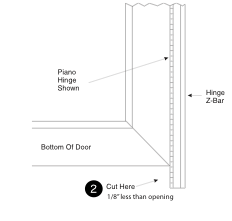 Before drilling for the handleset template, make certain the door slab is square in the opening and the location of the handleset will not interfere with the prime entry door handleset. 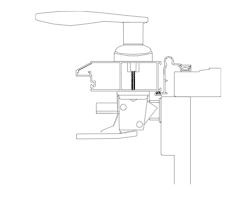 Proceed with the installation of the handleset. Install closer according to manufacturer's instruction in the closer box. 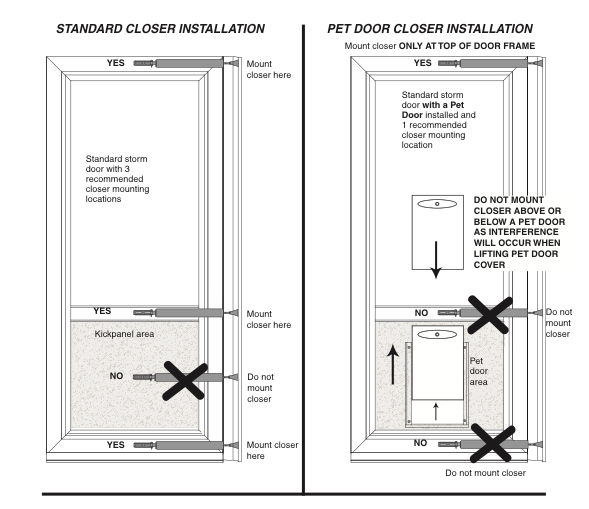 Do not install closer above a pet door. Do not install a closer on a kickpanel. 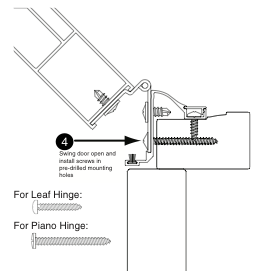 See illustrations for correct mounting locations. Adjust closer for the winter or summer setting by following the instructions from the manufacturer inside the closer box. Re-insert glass or screen insterts. Remount the sash/screen clips with the longest leg securing the sash/screen to the frame of the door. 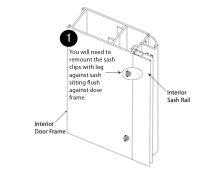 Additional sash/screen clips will be found inside the hardware box. Cut the screw cap covers with a hacksaw sized to length of the z-bars for both vertical and horizontal pieces. 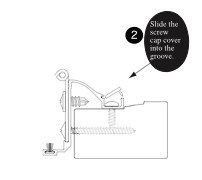 Insert the screw cap covers by using a soft mallet or gently tap the screw cap cover into the channel. Close the door and inspect for proper fit and lock up. Note: Soap or other non-oily product can make the screw cap covers easier to install. You did it! Great job!